The farmhouse is located on the ridge overlooking the valley of the rivers Savena and Setta. The complex stretches along the track and represents the ideal stop point of the "Via degli Dei" (Bologna - Florence) both for riders and for walkers. The agriturismo is situated near the foot of Monte Adone, 8 km from Monzuno. Perfect place for families, nature lovers, situated on the edge of the Natural Reserve of the Pliocene Buttress and close to Monterumici, stopping place and important location of the "Gothic Line" Project, it offers special opportunities for wonderful rides and walks to mountain-biking lovers and trekkers (you will find maps and information). At the guests’ disposal: outdoor swimming pool, a garden and playground, a barbecue, bicycles and a vegetable garden where you can "serve yourself" depending on the season, picking vegetables you can cook in the comfortable kitchens of the apartments. With free Wi-Fi throughout, the apartments have classic-style furniture, large windows, and Persian carpets. They include a TV, free toiletries, and a fully equipped kitchenette with a coffee machine and dishwasher. 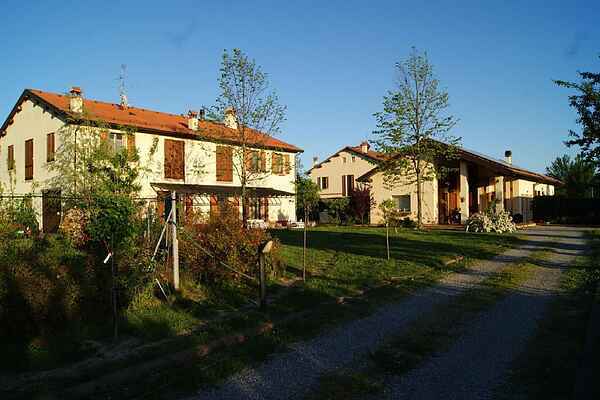 The agriturismo is specialised in horse breeding and has in total three apartments available. Those who like sporting activities will enjoy practicing activities like rock climbing at the famous wall of Rocca di Basolo, golfing at Moline del Pero (18 holes, 10 minutes far from the farmhouse), game fishing in an equipped lake about 2 km far from the farmhouse. Leaving the farmhouse for a day-trip, in less than half an hour from the city of Bologna you can visit the Historical Park of Mount Sole, the ancient Etruscan city of Misa, Mount Bibele with its excavations and the Celtic village with its Archaeological Museum, but also the Ferrari Museum in Maranello (MO) and the Ducati Museum in Bologna. For shopaholics, the great Outlet of Barberino di Mugello will be an authentic paradise on Earth.